The Hotel La Casa in Seoul is the definition of a hidden gem. I first heard about it from the TV program, Unique Hotels and Restaurants, and remember thinking that it looked incredibly chic. So when my friend recommended this hotel for my recent visit to Seoul because it happens to be super close to where she lives, I (uncharacteristically) did very little research and went for it. And I was duly impressed! Location: Located south of the river, it is in the Gangnam district (yes a la Gangnam Style!) and only a few blocks from the super trendy Garosugil area. We were able to a) enjoy super cute local cafes and coffee shops b) eat delicious local cuisine (i.e. korean bbq and fried chicken) c) drink in trendy wine bars or local joints and d) shop in a range of adorable boutiques without even taking a cab! It’s just such a fun and buzzing area to wander about in! La Casa also happens to be only a few blocks from the bus 6006 bus stop – which makes it super easy to get to and from the airport for only 10,000KRW. Since cabs are so cheap in Seoul I would usually not hesitate to take a cab, but given how easy taking the bus is it is almost silly not to take it, especially if you are travelling light and its not raining! From the airport: Take the 6006 and get off on the first stop. Turn right (backwards) and take the second left. It is part of the Casa furniture/cafe etc. complex. Go around. The hotel entrance is slightly inconspicious. To the airport: Go back to where you got off the bus (think TomTom’s) and cross the road. It comes every 10-20 minutes, and is quite on time. The one caveat is that I find the metro entrance a bit far away, probably a 10 minute walk. But then, as I was saying, cabs are relatively cheap and quite readily available in Seoul. As a back up, UBER is also available. The design and rooms: I hereby confirm that you basically get what you see. It is indeed as modern, minimalistic and chic as it looks. Very Scandinavian. The lobby resembles a cosy library/work station. A welcoming sight after a long day of travelling. And the rooms are spacious, chic and comfortable. We upgraded ourselves to a Business Double because they ran out of Deluxe Doubles. I love the dashes of red. It makes the room more fun and chic, instead of just cool and functional. There were also red pillows and throws at the end of the bed, but I removed it before I remembered to take a picture because I suspect that no one ever washes these things… in any hotels! 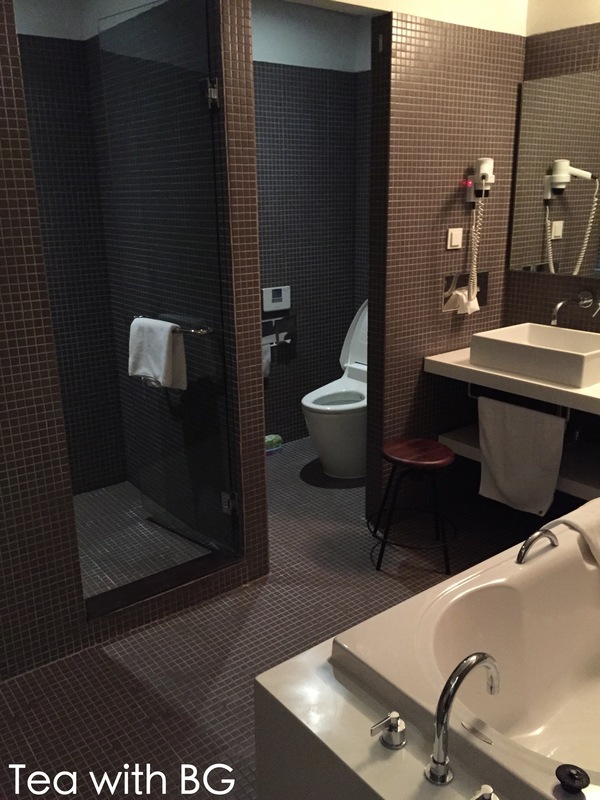 The bathroom was also modern, clean and functional. My only complaint is that the sink seemed slow to drain… and the weak blow dryer. Service: I thought the service in general was good. The staff spoke good English and had no trouble understanding me. They had umbrellas and adapters to borrow as well as complimentary wifi and breakfast (though I never woke up early enough to enjoy it). But most importantly for me they were generous with their complimentary bottled water. I am a water hog when I travel because I am always dehydrated. One bottle per person a night is not nearly enough. This really stood out for me. Other things of note: Being a boutique hotel, it is smaller in scale than I am used to. There is only one elevator (though I personally never encountered any elevator traffic ). There doesn’t seem to be much security measures. Technically anyone can come and go to whichever floor they want. Perhaps the hotel is so small the staff keeps track? And finally the entrance is very inconspicuous. Most of the time cab drivers just leave us on the other side of the building and we have to walk around in the cold and rain. Value: I took advantage of a US$100 off promotion and made the booking. From what I can tell though, their regular price range is in line with other boutique hotels in Seoul at around ~US$130/night. It’s not the cheapest and perhaps you can find similar hotels for even cheaper, but I think the price is fair for what you get. Conclusion: I’m actually surprise that the hotel is only ranked only #97 on Tripadvisor. 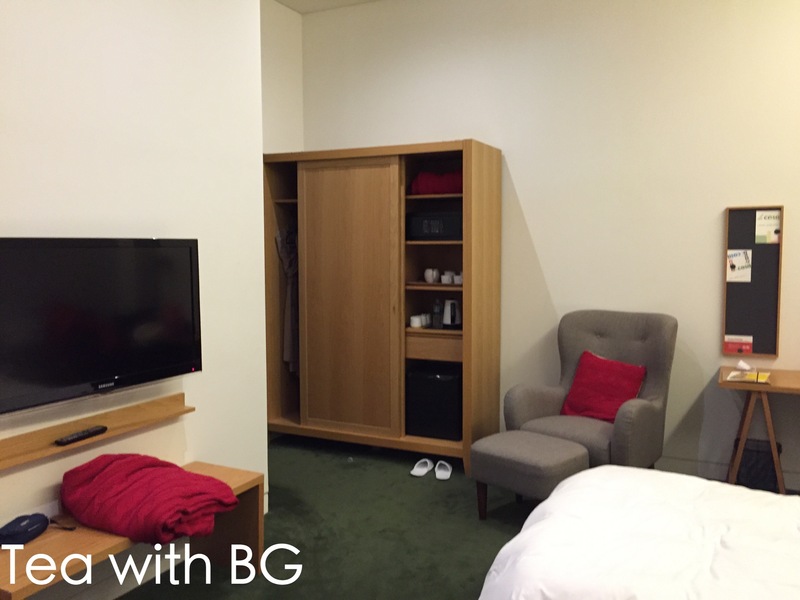 It is well situated, superbly designed in a modern and chic way with comfortably sized rooms (though I’m from Hong Kong, my sense of space maybe distorted) and helpful English speaking staff. Perhaps all Seoul boutique hotels are like this? My only comparison is the Grand Hyatt in Seoul (which is a different type of hotel), so I cannot comment. But I would definitely recommend this hotel to friends visiting Seoul!